A scheme that sees revellers given lollipops as they leave pubs and clubs has been credited with reducing late-night crime. West Oxfordshire Community Safety Partnership said the number of offences fell by 10% in Witney during a two-week period over Christmas. The number of serious assaults fell from 16 in 2005 to four in 2006. Research has shown that sugar in the lollipops helps stabilise the behaviour of people who have consumed alcohol. The partnership, which includes Thames Valley Police, is considering extending the scheme to other areas. Dennis Evernden, West Oxfordshire local area commander, said: "The lollipops appear to have been successful on this occasion in helping to reduce alcohol-fuelled disorder. "Compared to the same period in 2005, the figures for assaults, drunk and disorderly and public order incidents, show that last Christmas they fell by 10%." 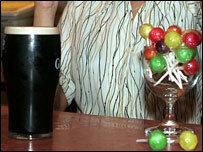 About 5,000 lollipops were distributed to licensed premises in Witney before Christmas.